Write Quickly and Neatly in Less Than 2 Hours! Cut your practice time in half! If you thought it would be hard to improve your handwriting, think again! This course makes it easy! Just print the 10 pages and fill in the blanks. Instantly turn new skills into new habits. Get the handwriting you need in under two hours! JUST CLICK HERE! LET'S GET STARTED! WHY TAKE THIS HANDWRITING COURSE? 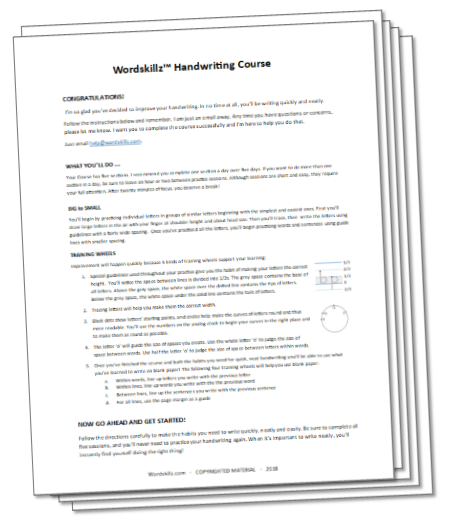 Most handwriting courses are designed for people just learning to write. They are not specially designed for people like you, people who've been writing for years. Why waste time starting from scratch? You don't need to learn to hold a pen. You don't need to practice loops and lines. You just need to replace some of your old handwriting habits with new, better ones. The fonts we see every day are easy to read. This course makes handwriting more like popular fonts. But don't worry. No one needs to write like a machine. We'll tweak your natural writing style to make it neater. That's all! However, when you take the course, you'll make the best use of your time. That's because, instead of working on each area one at a time, you'll work on all areas at once. You'll improve several skills simultaneously! The course is currently available at 50% off! I really want you to experience how effective Wordskillz™ Learning can be!